Tracey Daugherty tells the story of Billy Brammer. Billy Brammer is the author of The Gay Place. The Gay Place, written in 1961, was once hailed as the "best novel about American politics in our time". 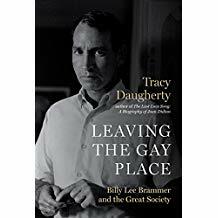 Leaving The Gay Place: Billy Brammer and The Great Society tells a sweeping story of American pop culture and politics through the life and work of a writer who tragically exemplifies the highs and lows of the country during the mid 20th-century. Daugherty follows Brammer from the halls of power in Washington D.C., where he worked for Senate majority leader Johnson, to rock-and-roll venues where he tripped with Janis Joplin! Then ultimately to back alleys of self-indulgence and self-destruction. Constantly driven to new ways of being and creating, often fueled by psychedelics, Brammer became a cult figure for an America on the cusp of monumental change, as the counterculture percolated through the Eisenhower years and burst out into the 1960's. Daugherty's masterful recounting of Brammer's story is a quintessential American story. Tracey Daugherty has written biographies on Joan Didion, Joseph Heller and Donald Barthelme, as well as four novels, six short story collections, a book of personal essays and a collection of essays on literature and writing. His stories and essays appear in the New Yorker, Vanity Fair, the Paris Review online, McSweeney's, Boulevard, Chelsea, the Georgia Review and many other journals. Daughtery has received fellowships from the Guggenheim Foundation, the National Endowment for the Arts, Bread Loaf, Artsmith, and the Vermont Studio Center. A member of PEN and the Texas Institute of Letters, he is a five-time winner of the Oregon Book Award. At Oregon State University, Daugherty helped found the Master of Fine Arts Program in Creative Writing and is now a Distinguished Professor of English and Creative Writing, Emeritus. This is the kind of book I would recommend as a gift for literature and non-fiction lovers. People who really enjoy reading as a hobby. Someone like myself. It was definitely an interesting book. I liked it because it recounted the story of a brilliant man who was a stuffy Washington politician that actually tripped with rock-and-roll stars!!! I mean really, how much weirder can you get than that? Leaving The Gay Place: Billy Brammer and The Great Society is available for $29.95 at www.utexaspress.edu, www.amazon.com, www.barnesandnoble.com. Like UT Press on Facebook: https://www.facebook.com/utexaspress/; Follow UT Press on Twitter: @UTexasPress; Follow UT Press on Instagram: https://www.instagram.com/utexaspress/; Follow UT Press on Pinterest: https://www.pinterest.com/utpress/; Follow UT Press on YouTube: https://www.youtube.com/c/utexaspress and Follow UT Press on Tumblr: http://utexaspress.tumblr.com/.